Around the world in 80 days? How about around the U.S. in 50 states? On Nov. 5, Jerusalem Post chief political correspondent Gil Hoffman made history as the first paid lecturer to speak about Israel in all 50 states. Hoffman’s talk in Honolulu on peace and politics in Israel marked the conclusion of a tour that began back in 2002. Over the years, he has lectured on behalf of AIPAC, the Anti-Defamation League, American Friends of Magen David Adom, the Jewish National Fund and Chabad-Lubavitch. At a certain point in the early days of his speaking tour, Hoffman set a goal for himself of lecturing in all 50 states. He was introduced to rabbis who run Chabad Houses in Montana, Utah, Idaho and Wyoming. As a result of these connections, Hoffman embarked on a four-day speaking tour in the spring of 2013 with the help of Rabbi Chaim Bruk in Montana, Rabbi Benny Zippel in Utah, Rabbi Mendel Lifshitz in Idaho and Rabbi Zalman Mendelsohn in Wyoming. Hoffman’s lecture tour has brought him to varied locations, including all kinds of synagogues and even churches. Audiences ranged from 10 to 300 people. 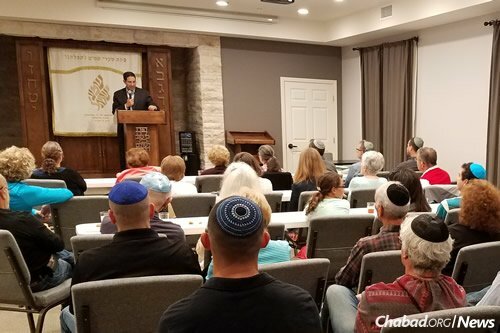 The smallest audience, he notes, was at the Chabad House in Fargo, N.D., where Rabbi Yonah Grossman had only just started out. Hoffman emphasizes that audience size fluctuated depending on location, but regardless, the message was always one of connection: to the listeners and Israel, and more often than not, to Hoffman and the Chabad of a particular locale. One of the first Chabad Houses that Hoffman ever spoke in was in Yorba Linda, Calif., directed by Rabbi David Eliezrie. The rabbi subsequently opened doors for Hoffman by recommending him as a speaker to other emissaries. But Hoffman’s connection to Chabad goes all the way back to his college days, where he connected with Rabbi Dov Hillel Klein of Chabad on Campus at Northwestern University in Evanston, Ill. “He gave me a proud Chabad perspective in my time there; my fondness for Chabad really started with him,” relates Hoffman. “He’s a wonderful man—one of the earliest Chabad on Campus rabbis.” Hoffman enjoyed many Shabbat meals with Klein and helped him make a minyan every day. Such was their close relationship.